New Jersey officials reprimanded LatestCasinoBonuses (http://www.lcb.org) March 1st for promoting unlicensed internet gaming websites to New Jersey residents, the latest move by the DGE to prohibit affiliates from promoting illegal, offshore online gambling in the state. Gambling.com has sight of a formal communication from the state Division of Gaming Enforcement warning LatestCasinoBonuses, also known as LCB, of their improprieties. In the letter, state gaming enforcement regulators wrote that LatestCasinoBonuses violated the New Jersey Casino Control Act. Only licensed, regulated betting sites are permitted in New Jersey so affiliate sites like LCB are not permitted to work with or promote illicit offshore sites while serving New Jersey players. The DGE warned the promotion of unlicensed gaming purveyors on LCB's site was a violation of state law and potentially federal law as well. New Jersey officials believe LCB potentially violated the Unlawful Internet Gambling Enforcement Act of 2006 by providing avenues for players across the country to play illegal games, not just state residents and visitors. Below is a screenshot from March 1st highlighting the illegal promotion of unlicensed casino sites to New Jersey residents on LCB's website. Here's a closer look at the note specifically recommending these illegal sites to New Jersey residents. The reprimand on LCB is the second major move in less than a month by New Jersey officials to crack down on bad actors promoting unlicensed gaming companies. On February 14th, the Office of the Attorney General banned OddsShark.com from working with any of the state’s legal sportsbooks for illicitly affiliating with and promoting illegal, offshore bookmakers alongside legal, regulated betting sites. The attorney general’s office released a public notice that further explained any legal online sportsbook would face retribution if it in any way continued working with OddsShark. The moves to ban OddsShark and reprimand LCB are a major statement by the Division of Gaming Enforcement in New Jersey but they are also just the first steps toward ultimately eliminating offshore gambling and unlawful affiliates from the New Jersey market and, in turn, help bolster its growing regulated market. Multiple media outlets in the US including Sports Illustrated and Bleacher Report similarly tout illegal sportsbooks in online posts but it's not yet clear how the DGE will handle non-affiliate sites promoting offshore gambling since they often don't partner directly with sportsbooks. Though enforcement officials have called out a couple of major players, there's still a long way to go. 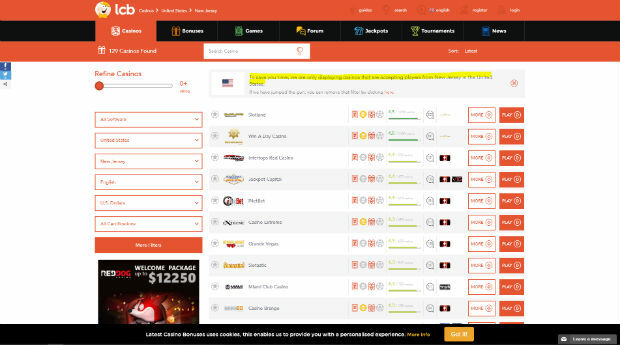 Fortunately, for US players looking for legal operators and don't want to accidentally end up with an offshore site there are resources like Gambling.com that are dedicated to only reviewing and recommending gambling sites fully licensed and regulated in the US. 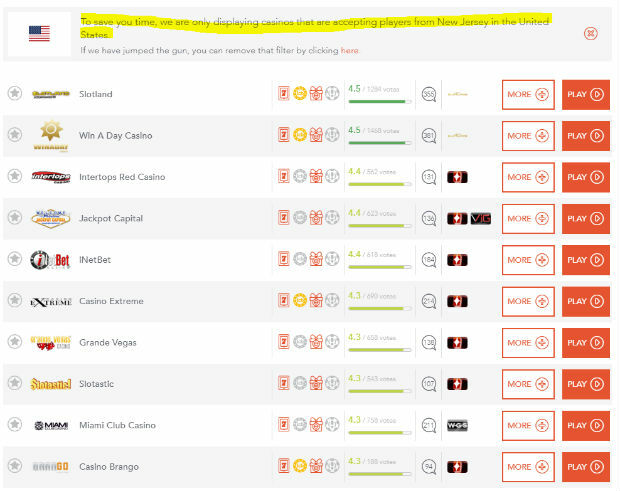 Players in New Jersey looking to compare the top casino sites can rest assured every site they find on Gambling.com is completely legal for them to use as long as they are 21+ and within state lines. These moves to sweep away promoting illegal, offshore gambling should come as no surprise in a state that has spearheaded some of the nation’s most dramatic legal gaming expansion measures. 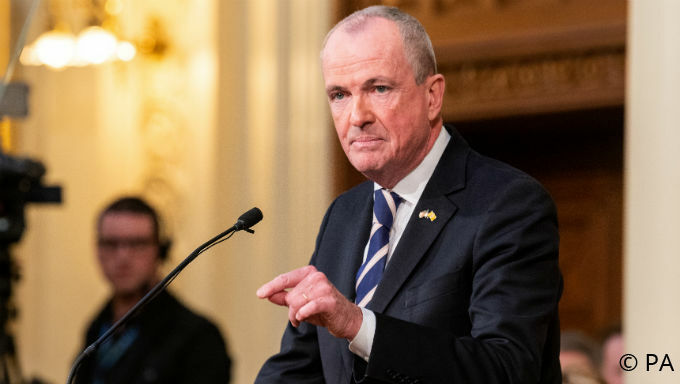 Garden State officials spearheaded the legal challenges that ultimately led the Supreme Court to overturn the federal ban on sports betting. After years of work and millions of dollars in court fees to take sports bets, New Jersey continues to assure its market is not threatened by external forces. That includes protecting the growing number of legal sportsbooks in Atlantic City as well as Monmouth Park and the Meadowlands. The second state after Nevada to permit legal online sports betting, internet-based wagering via sports, poker and casino gaming has garnered more than $1 billion dollars in wagers just since New Jersey took its first legal sports bet in June 2018. Even with a legal market, New Jersey is still fending off illegal, offshore sportsbooks. The American Gaming Association estimates Americans wager as much as $150 billion dollars illegally each year, with much of that coming from unregulated sites originating in other countries. Conversely the legal market assures player protections and creates a new tax revenue source for the New Jersey government. The state now sees hundreds of millions of dollars in legal wagers each month placed in licensed gaming facilities, of which the state then taxes around 10 percent of their profits. New Jersey’s legal gaming market will now continue to find ways to grow legally without one more bad actor. Editor's note: At the time of publishing this article, the site in question still explicitly promotes illegal, offshore casino sites.